Ok, I’m a little slow getting this together, but it seems to be getting some traction. So I get this email from Jason Box, basically throwing down a gauntlet and challenging my all-around manliness if I don’t follow his example in doing something stupid. Well, that wouldn’t be the first time. Ok, I’ll bite. Jason challenged me, as well as Dana Nuccitelli of the Guardian and John Cook of Skeptical Science to dump icy water on our heads – while mumbling some weak Euro-trash excuse about why he doesn’t actually have any ice in his bucket. I’ve been pretty busy, but managed finally to put a response together, and here it is. So, while I’ve been putting this together, Dana responded smartly, a few days ago, himself challenging Mike Mann, Katharine Hayhoe, and Kevin Cowtan to take up the bucket. John Cook is still MIA, citing his being in England, where its much too cold for an Aussie to engage in chilly activities. I think he’ll come around. and finally, the original instigator, Andy Lee Robinson, here. 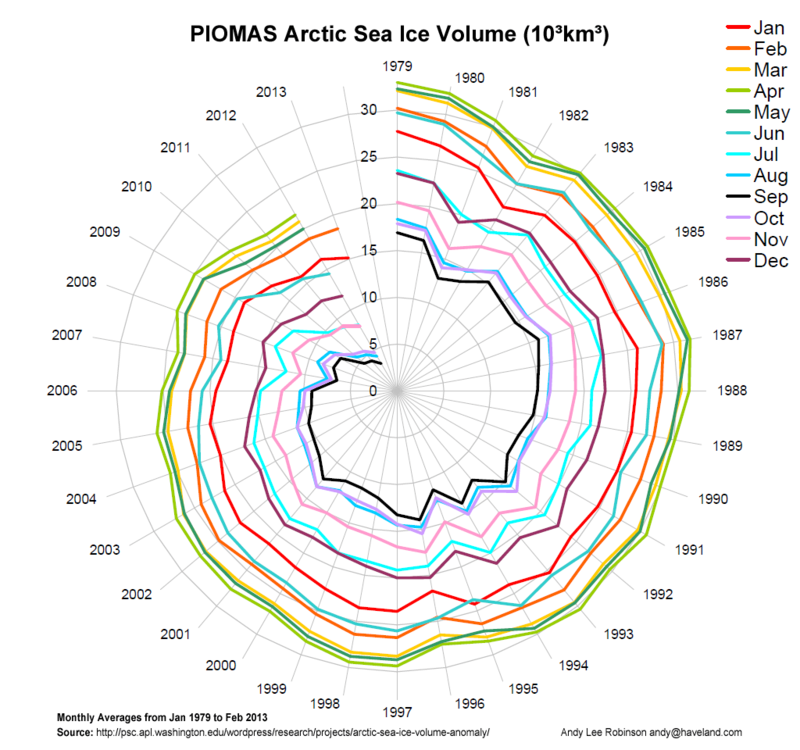 as well as his famous Arctic Death Spiral Graph. Ice bucket challenges are all the rage these days. Kinda fun, if not a little chilly. Here are two of my faves IBCs so far. Well done Peter, that was really cool! I think the ice bucket thing is overdone and we should change it up a bit. Because it is artic ice you should freeze all the water in a very thin baking pain. Take the very thin sheet of ice and break over your head (while recording). This is a better representation of what is happening in the arctic. Call it the Artic Sea Ice challenge! Just kick the bucket completely. You should also challenge Watts and company but they should freeze all the water in the full bucket first! I met the physical part of your challenge here, and addressed the more important support part as well.